Here in our Central Virginia garden & yard I/we are in Fall mode. This is always a combination of cleaning up and closing down along with strategizing on how to keep ongoing projects running despite bad weather. The big thing this year was to get the gravel work area installed in front of the barn. It’s a place to store equipment, fill buckets, and work outside without standing in mud. It’s been on the TO-DO list for a long time but only this last weekend did the available manpower synchronize with the large pile of gravel we had delivered. Younger son and two granddaughters worked with Kip to load and haul many wheelbarrows of gravel to the area where I leveled it with a rake. Of course we were burning up all the calories we’d had for our breakfast; sausage, fried eggs, toast and jam and applesauce; all home grown/homemade. Most of our hens are just chugging along pumping out eggs but a few of the girls are nearing the end of productivity and there are two roosters who are beginning to raise hell. So it’s time to cull. This means a late evening trip out to the coop to lift the selected birds off the roost to put in the holding pen for slaughter. Next week. The two ‘Jer-Stein’ calves, Lucy and Lilli, are doing well. They are learning to be led, to stand when told, and behave calmly with people. We are aiming to wean them from the bottle over the next few weeks. The way they enjoy the bottles is such a gas – huge slurping, drooling, babies that run to us when they see us coming into the barn. 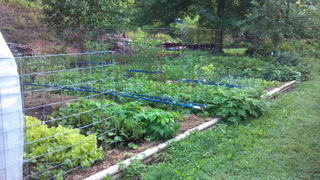 Our large garden is mostly clear of the summer plantings. The three covered rows contain the more tender veggies for all fall and winter (or as late into winter as they can be coaxed to survive!). The covered crops are chard, carrot, beet, and two varieties of lettuce. The uncovered green patches are pac choi, collards (2 kinds; Georgia & Vates), kale (2 kinds; Lacanato & Green Curled Winterbor) and bunching onion. Unlike former years the hens didn’t get the run of the big garden to clean it up for winter because I ended up scattering the planted patches instead of concentrating the fall plantings at one end. As usual I have planted a large Elephant Garlic bed. We’ll see the first sprouts sometime in late December than I’ll mulch the bed and wait for spring. After we harvested late potatoes we used that bed to broad sow turnip for greens for the animals. We’ll feed those greens for as long as they last. The same is the case for the oat bed. These plantings keep the soil busy – which is a principal of mine – I don’t like to see bare soil just hanging out. I either want to sow some sort of cover crop in it or to mulch it heavily in a form of sheet composting through the winter. The large bare spaces in the big garden have been sown with oats, turnip, and buckwheat seed but we may have cut it too close and now it’s too cold for a good germination. In the hoop house the aquaculture unit is still in the experimental stage. Making the syphon work in the way it needs to do in order to drain the growing bed back into the fish tank has proved a bit tricky so more tinkering is needed. Now with all the summer plants have been pulled out I’ve created a large indoor compost pile in there in the hopes of holding the heat in that building above freezing. Again, this is a work-in-progress but so far it seems to be effective. In the hoop house is also the new indoor sprouts setup. As you can see in the picture the soaked oats when given warmth and regular rinsing become an amazing mat of sprouts. We create a ‘salad’ of oat sprouts, chopped comfrey leaves, and turnip leaves. The calves love, love, love it! And the hens as well. Our winter firewood stack is getting larger and larger. A couple of weeks ago our granddaughters, under the supervision of our daughter, ran the log splitter all day Sunday. Stacked wood is perhaps one of the most satisfying sights one can see! The most unusual occurrence of the week; at the fall of the last leaves off the Japanese persimmon the granddaughters spotted the lone fruit of this season!! It had successfully hidden in the leaves all summer. Last year I harvested 48 fruit but this year only one! Sigh.